Though Contemporary YA is a sprawling genre that deals with a wide variety of themes and characters, there are surprisingly few writers willing to take extreme chances with their books, and mix things up until their stories have become as morally ambiguous as FMA (choose preferred version where applicable). Hannah Moskowitz is one of them. Another is E. Lockhart. A third is Sara Zarr. This isn’t my first Zarr novel. I read “Story of a Girl” back in January 2011 and found it to be a harsh but valuable story - one where there weren’t clear-cut villains or perfect solutions or a happy ending, just… acceptance. And maybe some closure. “How to Save a Life” is different. Not better or worse, just… different. The story is told from the alternating points of view of Mandy and Jill - the former a pregnant teenager, and the latter the daughter of the woman who wants to adopt Mandy’s baby. Both girls have a lot of things to think about, and their combined narration really makes for a compelling story. One thing you should know is that Sara Zarr’s books are pretty much character driven, with very little overarching plot to tie things together. Which is fine by me - I think I’ve mentioned it once or twice or a billion times I prefer compelling characters to a fast-paced plot any day of the week and twice on Sunday. “How to Save a Life” is not an exception - both characters are well drawn and complex. Jill, torn up over the death of her father, is ANGRY, simply ENRAGED, and her tendency to lash out at any time has driven her friends and boyfriend away. Mandy is… uncomfortable. Not in the physical sense of being uncomfortable in her own skin (like so many of us), but uncomfortable as a character. From her first sentence, I felt as uneasy as the people interacting with her did. Somehow, the supporting cast didn’t feel quite as fleshed out - there are certainly some characters with whom I would have preferred to spend more time with - but that’s more personal preference than it is an actual problem with the book. I think the story Zarr wanted to tell was that of two girls building a rapport and finding what they really need in life. What I didn’t particularly like was the route Zarr took to reaching the finish line. Like I said, there is very little overarching plot here, but what exists of it pretty much comes apart at the seams during the book’s climax. It’s like one of those stories where the author builds up to some dramatic confrontation, and then chickens out at the last minute by having everything magically resolve itself (or give us a fade-to-black). It was anticlimactic, is what I’m saying. And the really annoying thing is that, if not for this one accident, perhaps the climax could have been avoided altogether. I understand the character set-up, but it just didn’t feel genuine to me. For comparison, allow me to bring up another contemporary YA book, Pretty Amy. Now, while the main plot of Pretty Amy revolved around the aftermath of the titular character’s arrest (for possession), a lot of the tension comes from the relationships between Amy and the people around her. More importantly, it comes from communication failures. Now, in “How to Save a Life”, we have a somehow similar situation, but not quite. 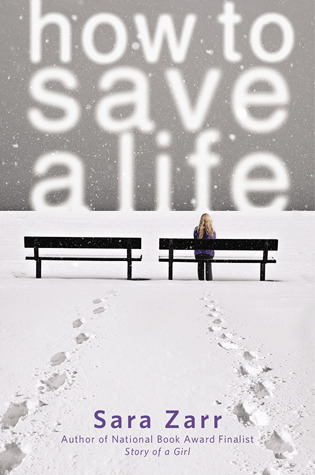 Both books have characters struggling to overcome a lifetime of being put down and effectively TALK to the people around them, but while “How to Save a Life” alludes to those bad episodes, in “Pretty Amy”, the characters just keep digging themselves in, again and again, and the situation just feels… unavoidable. Even if, in both cases, things would have been made better by the characters using their words, “Pretty Amy” is the one where the outcome feels natural to me as a reader. “How to Save a Life”, on the other hand, came out as just a touch contrived. I’m not saying it’s bad, or even worse than “Story of a Girl”, or “Pretty Amy”. But I would have liked more tension. I would have liked more urgency. Note: Image and synopsis courtesy to Goodreads.